Honorio Rubio in the cellar tasting barrel samples. Honorio Rubio’s Limited Edition Rioja whites received strong debut notices by Luis Gutiérrez in The Wine Advocate, Issue 226 (August 30, 2016). The wines were “Añadas” NV solera aged (2012 bottling) with 93 points, “Lias Finas” 2011 long lees aged Crianza with 92 points and “Macerado” orange style long skin contact 2013 with 91 points. Not too bad a showing for the first reviews in the major US press! 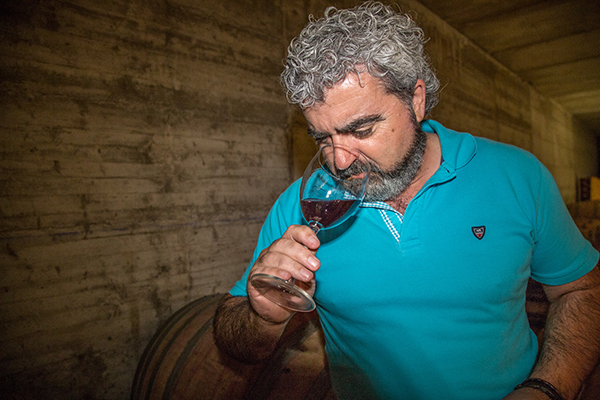 Perhaps more important than the points, is that Mr. Gutiérrez closed his write up on Honorio’s innovative and quality-driven techniques by noting of Honorio: “A new name to follow in Rioja”. We agree completely. Honorio’s creations are wines to watch, and some of the most exciting whites coming out of Spain today.